This month I have made visits to two of the most impressive and interesting Asian markets. South Korea now has an economy which is, in many respect, more advanced than most European economies with an income per capita near to US$30,000, and US$600 billion of exports, half of which is machinery and automobiles. They are now also a substantial investor in the emerging nations of Asia, especially Vietnam, where they are (with Japan) the largest source of foreign direct investment (and Samsung Electronics alone, accounts for 20% of Vietnam’s exports). In fact Vietnam, alone among ASEAN nations has the same intensive private education emphasis as the North Asian nations (Japan, Korea, China and Taiwan). It is interesting to reflect that it is just over 40 years, since the end of the war in Vietnam in 1975, and the unification of South and North Vietnam. This is now a young, dynamic and progressive country with half the population under 30 years old, and a tremendous thirst for self- improvement. For instance, we visited the Vietnamese software company (FPT) which reminded me of the Indian software company, Infosys, 20 years ago. They are training 17,000 students a year and pay their software engineers competitive salaries compared to India. They have a particularly strong position in servicing major Japanese corporations. Although from the US perspective, North Korea looks very threatening, the surprising thing is that on the ground in Seoul, people are so accustomed to living 30 miles from North Korea, that (after 64 years) of living with a “crazy neighbour” it is no longer a daily concern. South Korean investors are much more focused on whether the new government, under President Moon Jae-in will be able to reform the Chaebols, and improve corporate governance, transparency and dividend payout ratios. From being the most leveraged companies in the world in 1998, Korean companies are now the most cash rich, and the market is selling on a PE of 9x and less than 1x book (including Samsung Electronics with a PE of 8x). There are also many smaller companies like Nasmedia, NCSoft and Naver in the on-line, video game, and digital advertising businesses which despite the sluggish South Korean economy, are achieving 20 to 30% earnings growth. Korea is an impressive and disciplined Confucian culture, but it also has a creative side visible in the popular TV shows, the Gangnam music, and in the business creativity of the younger generation in these new internet fields, and the digital sector. The immediate problem for the Korean consumer and hotel companies is the collapse of Chinese tourism, as a result of the freezing of tours by China, after the Terminal High Altitude Area Defense system. We expect this situation may take a year to resolve, but longer term, the real question is whether Trump and Xi Jinping will make a deal to denuclearise the peninsula, remove Kim Jong-un, and enable China to have an unchallenged regional influence, while allowing a reunited Korea to develop economically. This would be very positive for Korean shares. The US military has just moved to a very expensive new base outside of Seoul, so there is no immediate sign that a deal is imminent, but it is something worth considering as an outside possibility. North Korea is also developing more capitalist tendencies and this will slowly undermine the monolithic totalitarian rule. As for Re-Unification, the previous examples of Vietnam (since 1975) and Germany (since 1990) suggest that the cost, and the time for Korea to reunify and rebuild the shattered economy of the North would be a huge drain on their resources (the estimated GDP of North Korea is US$12.38 billion with an estimated population of about 25 million, compared to South Korea with US$1,443 billion and 50 million population). 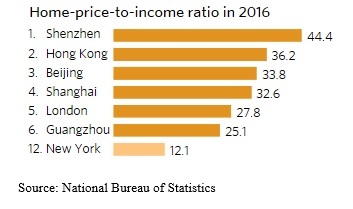 Meanwhile, in China, my concern remains that despite the professed desire of the government to have a smooth transition to the autumn 19th National Congress of the Communist Party of China, the over investment and the debt bubbles are still at extremes, and the level of property prices remains very inflated. We are beginning to see some signs of weakness now in Shenzhen, and of course in Hong Kong which is also very high. This summer we expect a correction to begin in these inflated property markets. The risk in China is not so much economic as political: if there is any factional discord ahead of the party meeting, this will certainly spill over into the markets. India has seen the introduction of the Goods and Services Tax on July 1st and as far as we can judge it has been a smooth process, as the demonetisation was last year, improving the transparency and level playing field of Indian business, and reducing a large part of the ‘black economy’ which has been estimated to be up to 40% of GDP. There is an increase in M&A activity – one of our preferred financial groups, Shriram City Union, has been the target of a takeover bid by IDFC. Among Mr Modi’s achievements in the past 3 years, has been an increase in FDI to about US$50 billion annually, a reduction in India’s external deficit from 5% to less than 1%, and a fall in inflation to 2%, so that today India is one of best performing emerging markets, with the Rupee up 5% this year. In Pakistan, there has been some currency and political instability but we take a long term view of our investments in the Frontier Markets and are gradually adding to core positions there and in Bangladesh, Sri Lanka and Vietnam. In conclusion, the risk for Asian markets over the summer remains the global risk of rising rates, and “tapering” QE, but we believe that any correction will prove a long term buying opportunity in the East.